Hamilton's lineup of automatic (self winding) movements is a entire genre of watch collecting unto itself. The first automatics showed up in 1954 with a series that started with K... as in K-400, etc. 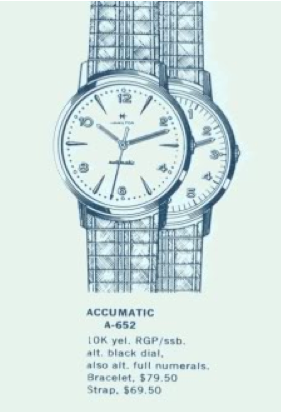 Over the next 16 years other automatics with models starting with A and T were introduced with prefixes like "Accumatic", "Thin-o-matic" or just "Automatic". Auto's with calendar functions were often part of the Dateline series. It's quite an alphabet soup, really. I have a few automatics in my collection and one of them is the 1962 Accumatic A-652. This model was produced through 1969 with slight dial variations available over the seven years it was manufactured. As best I can tell, the A-652 came with three potential dial options; the numeral and marker dial in white, the numeral marker dial in black, and an all numeral dial. Identifying an automatic watch's model can be a challenge... the best way to go about it is first to identify the material the case is made of (solid gold, gold filled, gold plate (RGP), stainless steel, etc. 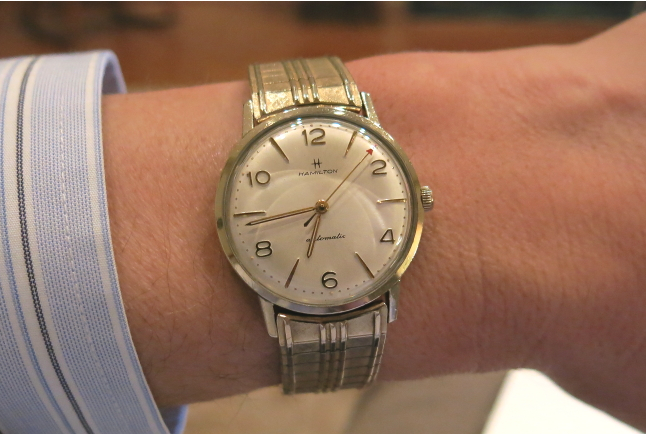 ), then you look at the case shape (with focus on the lugs), and finally the dial configuration and even hands. 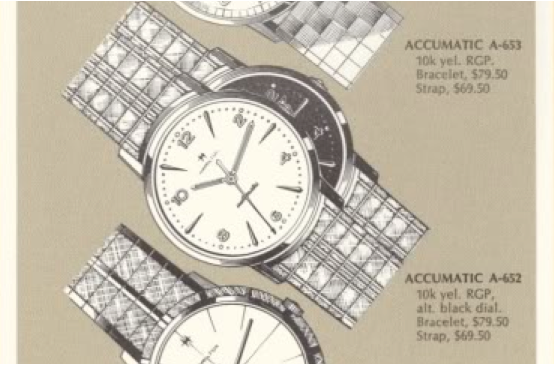 It can be pretty tedious and even then you still might not be able to identify it, as there are lots of models that were not catalogued - especially presentation watches (like 25 year service anniversaries). All of the automatic movements were purchased by Hamilton but made elsewhere - typically Swiss movements made by ETA (some by Buren). The Accumatic A-652 originally came in a 10K yellow Rolled Gold Plate (RGP) case with a stainless back. However, in 1965 it appears to have come in a fully RGP case. Regardless of the case back, it opens through the crystal and this watch has an 11.5 ligne 689A movement behind the dial. I recently installed a new old stock (NOS) original bracelet on mine. Collecting original bracelets is another genre of collecting that very few have the attention to detail to effectively pull off. I'm not one of them but one of my friends is - and he hooked me up with this one. Hamilton's bracelets were provided by several manufacturers... Kreisler, Gemex, Champion, etc. but never by Speidel. So if you see a Speidel bracelet on a Hamilton watch and you wonder if it's original there's an excellent chance that it is not. I purchased one that arrived today. Appears to be identical to this, other than the back is 10K RGP. Is that a possibility and it still would be a 652. It appears that I have a brushed silver dial. I can not tell by your photo if that is similar in yours or would it be white? I have no idea how to open it. I hade it under the stereo microscope and no signs of how to lift. You could send me a photo to be sure but I suspect if the back is not stainless then it could be something different. As for how to open it, it is probably a one-piece case and opens through the crystal. You have to pull the crystal and then everything comes out the front.